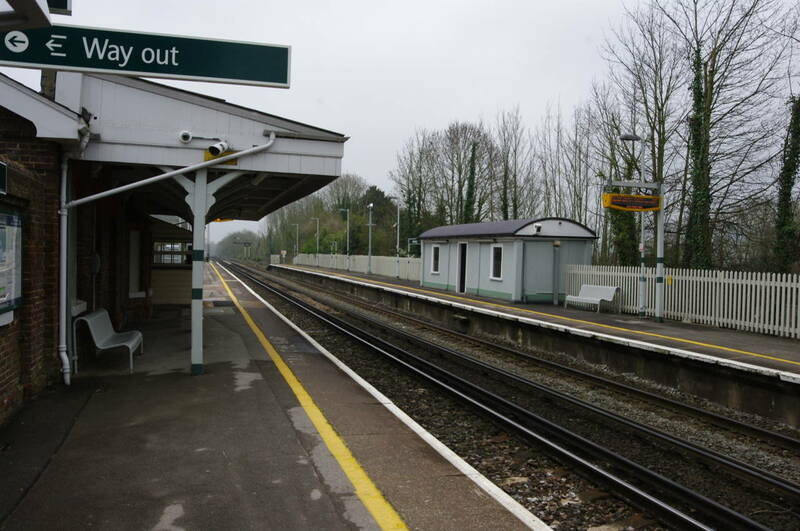 I arrived back at Amberley Station (picture 1) on a cold and foggy Thursday morning to resume my walk along the South Downs Way. 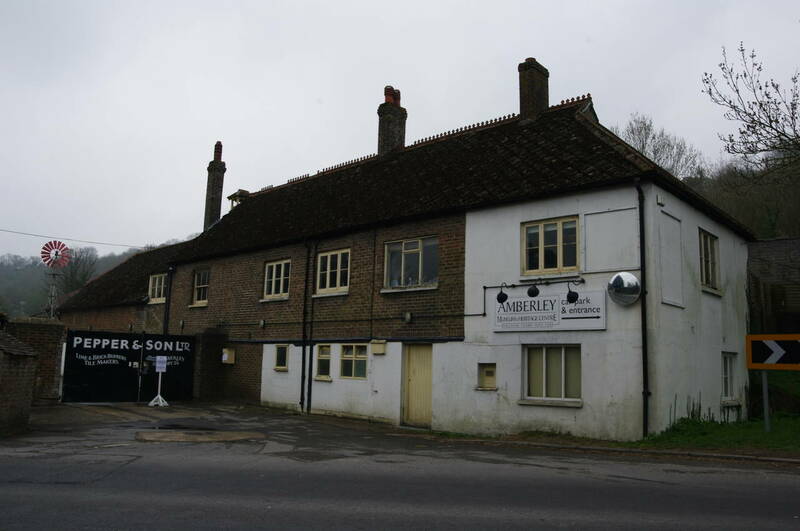 Adjacent to the station is the entrance of the Amberley Working Museum (picture 2), which occupies an old quarry and covers various traditional industries including a foundry, a blacksmith's, and various manufacturing workshops. 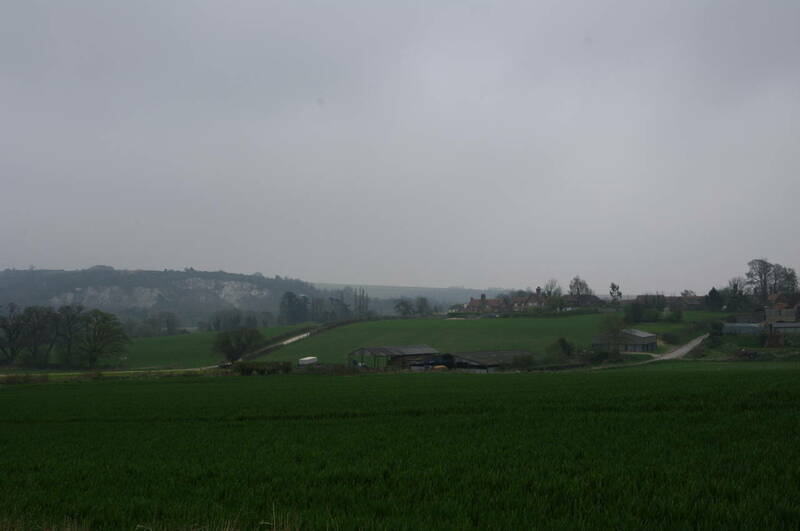 A short distance north of the museum I rejoined the South Downs Way next to the stone wall of Quarry House. 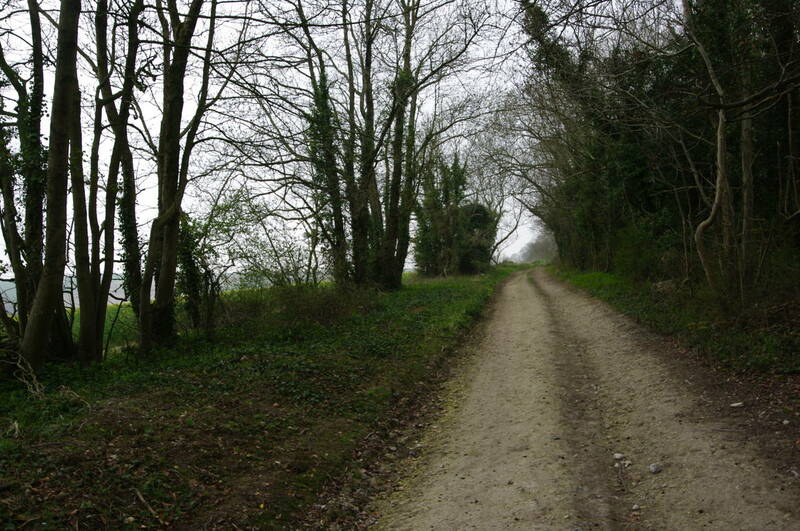 The path runs beside New Barn Road for a short distance before crossing over and running parallel with the road once again. 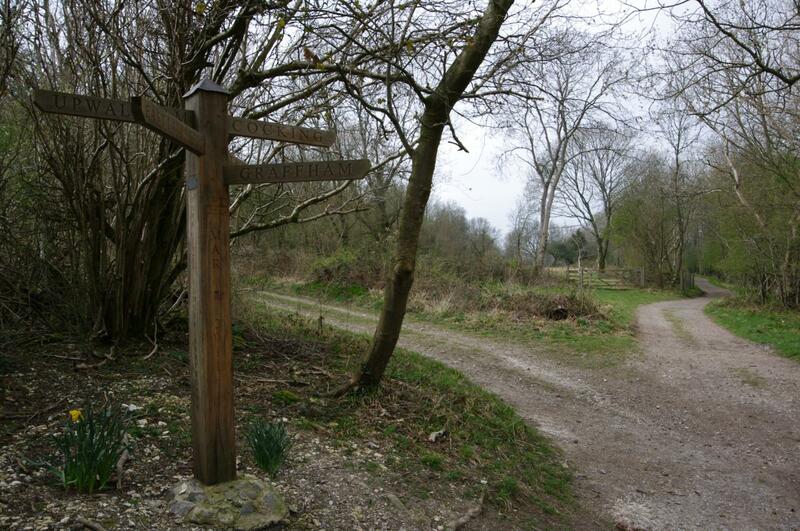 Reaching a wooden fingerpost, the path turns left and follows a farm track over the railway line. Beyond a South Downs Way water point that appeared not to be working, the track turns left again for a short distance before climbing up onto the floodbank of the River Arun and following it upstream to a footbridge. 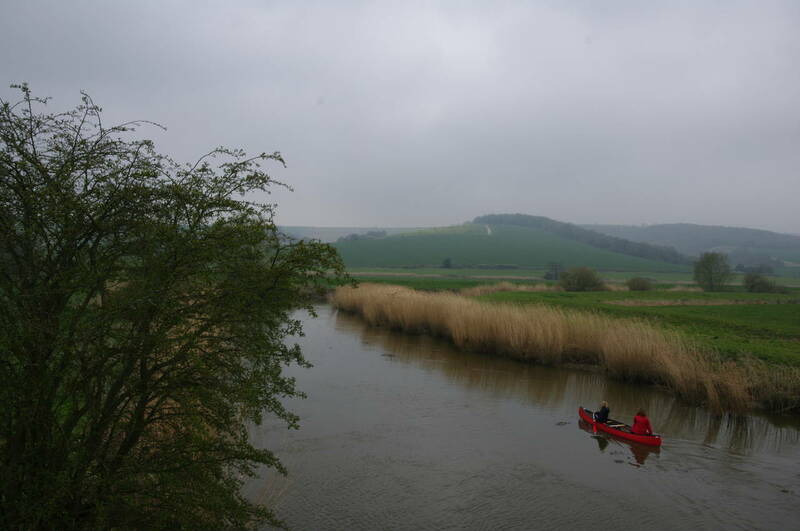 As I crossed the bridge a couple of women in a canoe rowed under the bridge (picture 3). 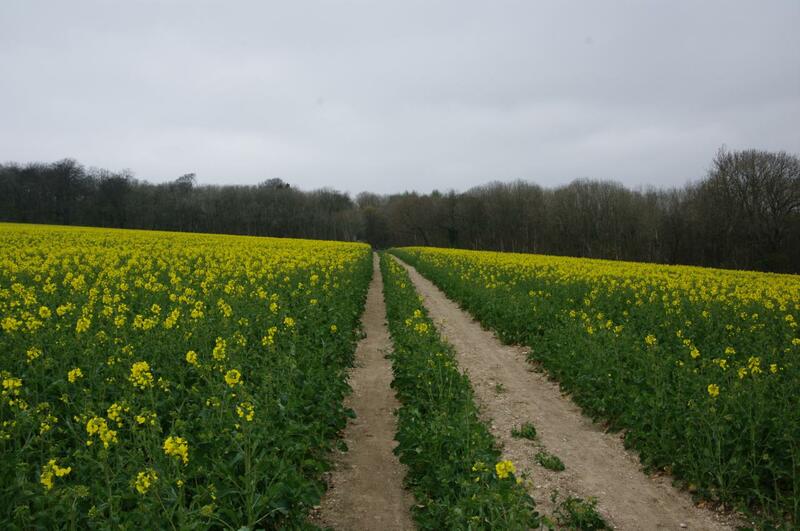 The path soon leaves the river and crosses a field and a road before beginning to climb uphill towards Coombe Wood with the small village of Houghton across the fields to the left (picture 4). The path soon levels out and runs along the edge of Coombe Wood (picture 5) before crossing the surprisingly quiet A29 road and following a farm track up onto Bury Hill, where there were misty views ahead along the path ahead to Westburton Hill, where crops finally added a little colour to the foggy grey scene (picture 6). 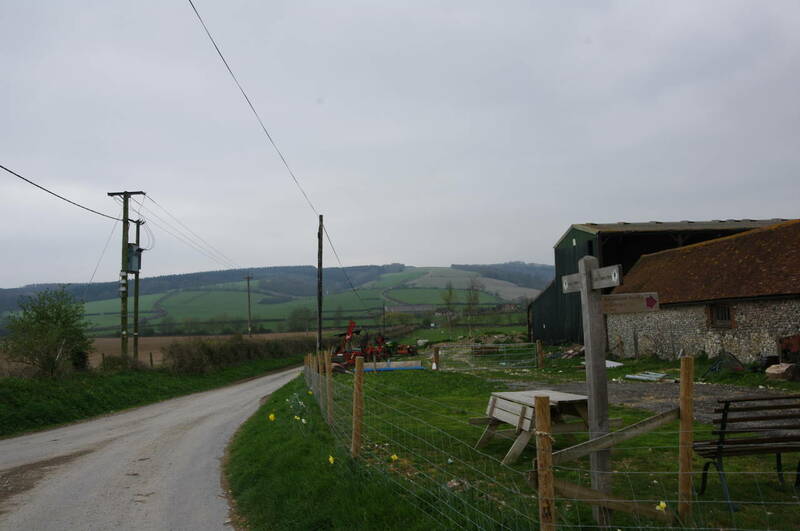 From Westburton Hill, the track drops down and does a U-turn at some farm buildings before climbing steeply up Bignor Hill opposite (picture 7). Here the wind was particularly biting and I was still shivering by the time I reached the top of the hill despite the strenuous climb. 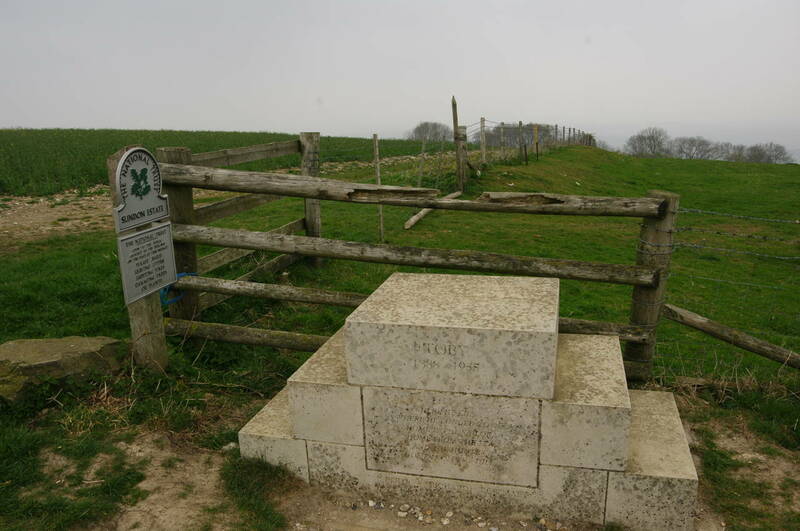 At the top of the climb the path turns shaprly once again and heads west across the plateau of Bignor Hill, passing Toby's Stone (picture 8), a set of horse-mounting steps built as a memorial to a former secretary of the local hunt. The stone bears the inscription "Toby 1888 - 1955. Here he lies, where he longed to be. Home is the sailor, home from the sea, and the hunter, home from the hill." 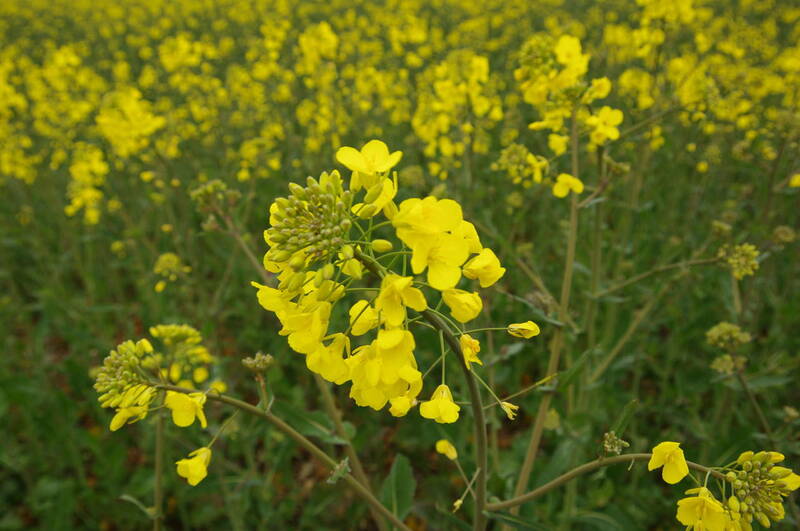 The track continues across Bignor Hill between more fields full of waist high crops topped by small yellow flowers (picture 9), though I'm not sure exactly what the crop is. After a little more than a kilometre, the track reaches a National Trust carpark where a latin signpost (picture 10) offers a clue that the ancient Roman road of Stane Street passes nearby. 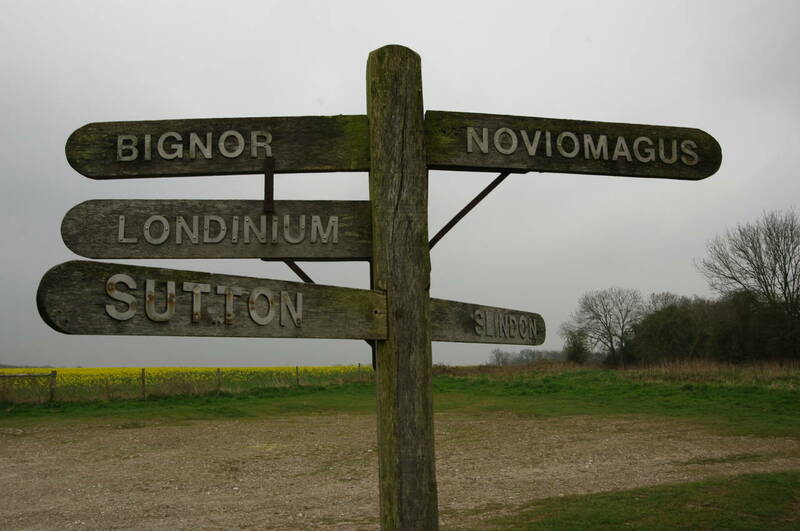 Stane Street used to run from Londinium (London) to Noviomagus (Chichester) on the south coast. A short distance further along the track, the Way joins Stane Street for a hundred meters before resuming its journey westwards along a grassy path below the peak of Glacing Beacon where two tall radio masts stand amidst a large clump of trees (picture 11). 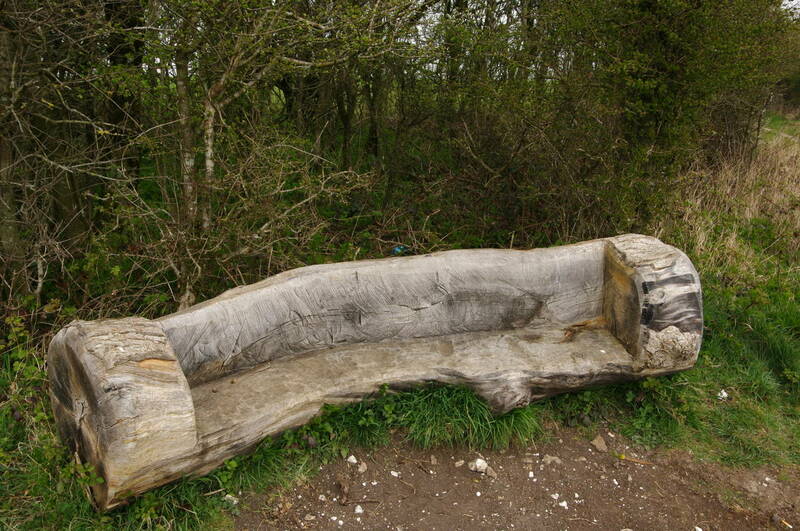 Reaching a clump of trees on Burton Down, the path passes an unusual seat carved from a log (picture 12). 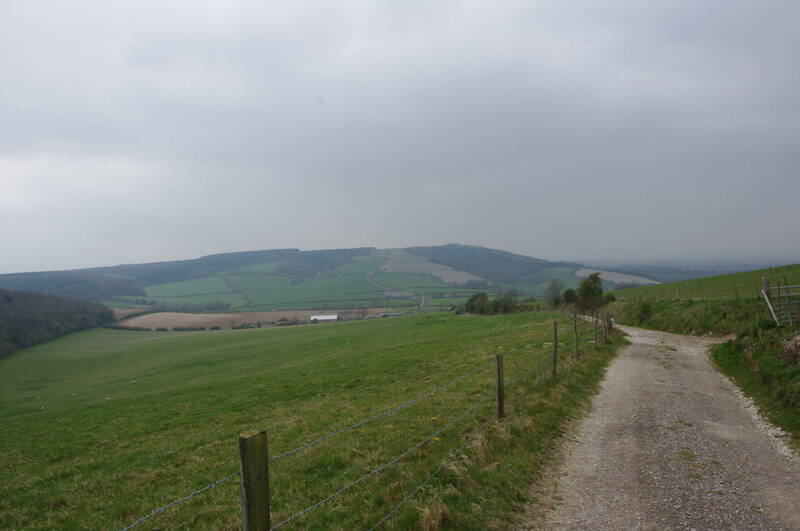 The Way follows a broad track across Sutton Down (picture 13) before a long downhill stretch takes the Way through a patch of forest and down to cross the A285 in front of Littleton Farm (picture 14). The path immediately begins to climb again beside the farm and up onto Littleton Down, from which there were views back across the valley to the path I had just walked down (picture 15). 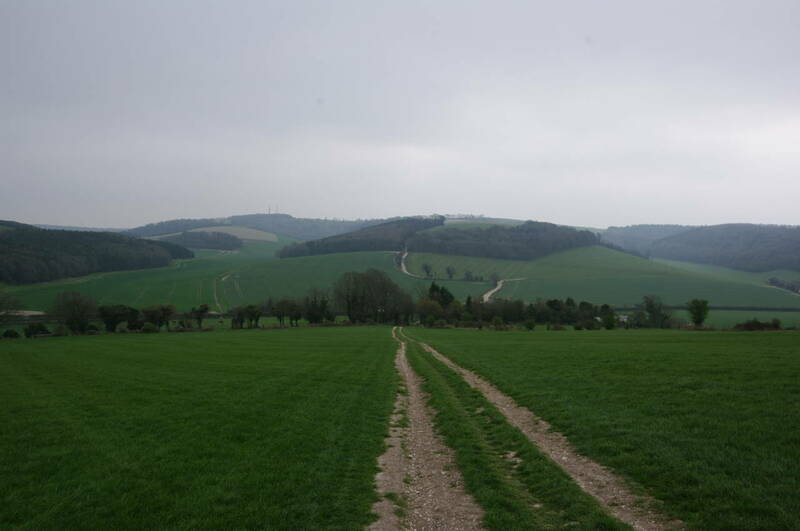 The track then continues over the top of Littleton Down through the middle of another crop and into the woods of Crown Tegleaze (picture 16). 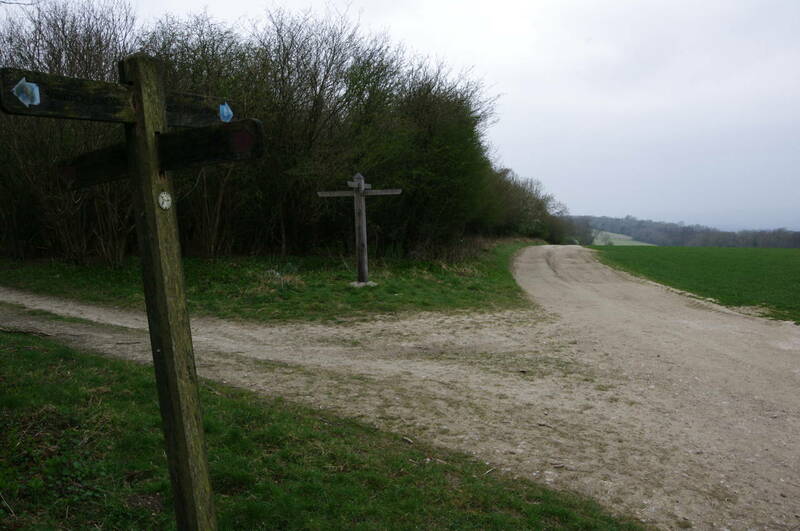 On the other side of the woods, the route passes an intersection of tracks where a very weathered South Downs Way signpost stands opposite the rather newer Tegleaze Post (picture 17), dated March 2011. 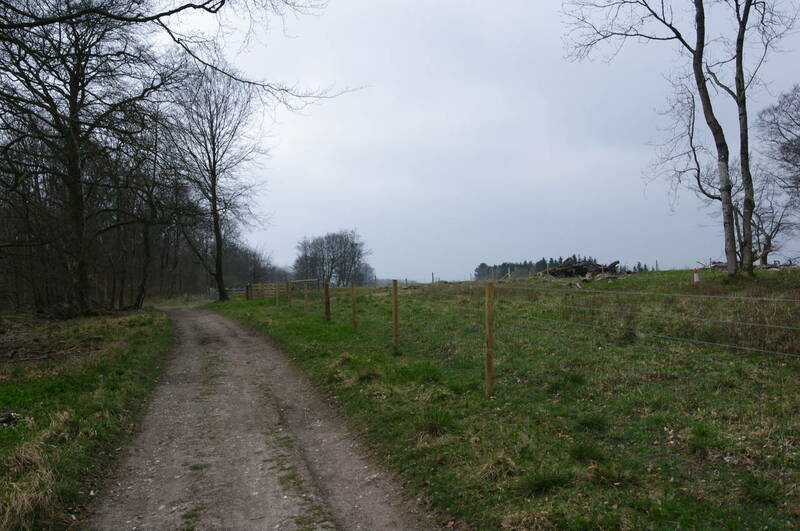 After another two kilometres of fairly level walking along the edge of woods, the route passes by the similar Graffham Post (picture 18), also dated March 2011. 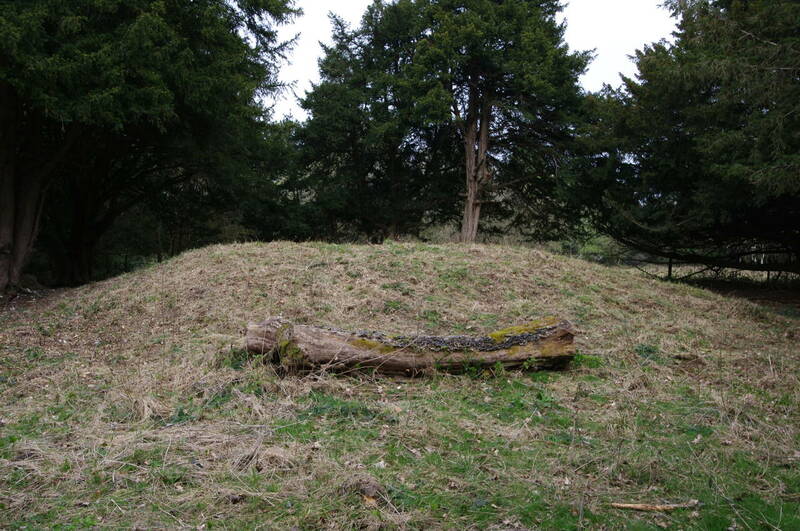 From the Graffham Post, the route heads westwards through the woods of Graffham Down, passing a tumulus (bronze age burial mound) next to the broad track (picture 19). 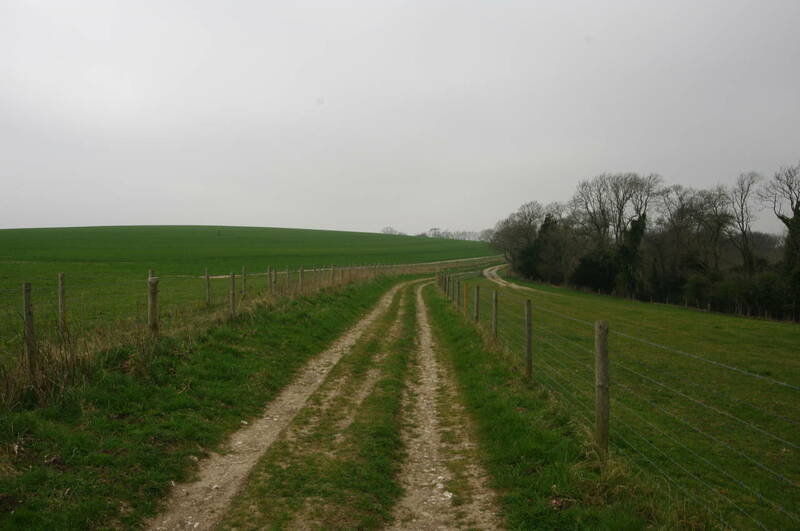 A couple of kilometres further west, the track emerges into a field on Heyshott Down where there is another group of tumuli on the edge of the woods to the right of the path. 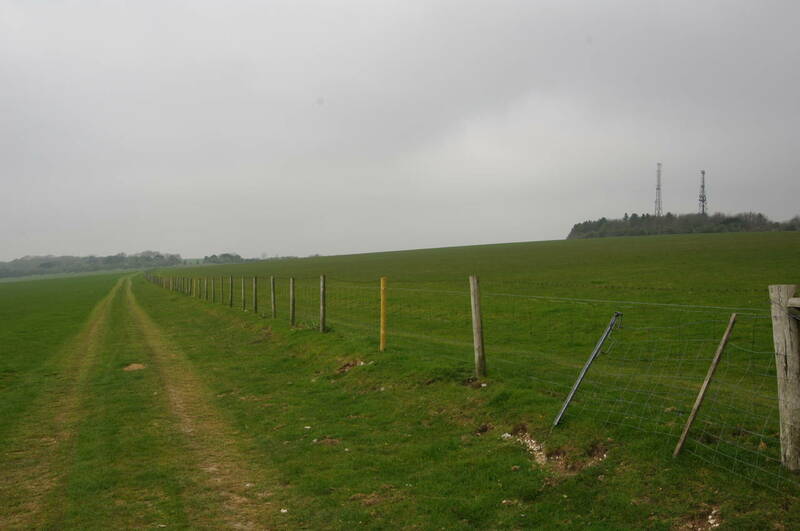 A short distance further, the track begins to pass the long open pasture of Manorfarm Down, where hundreds of cattle were grazing (picture 20). 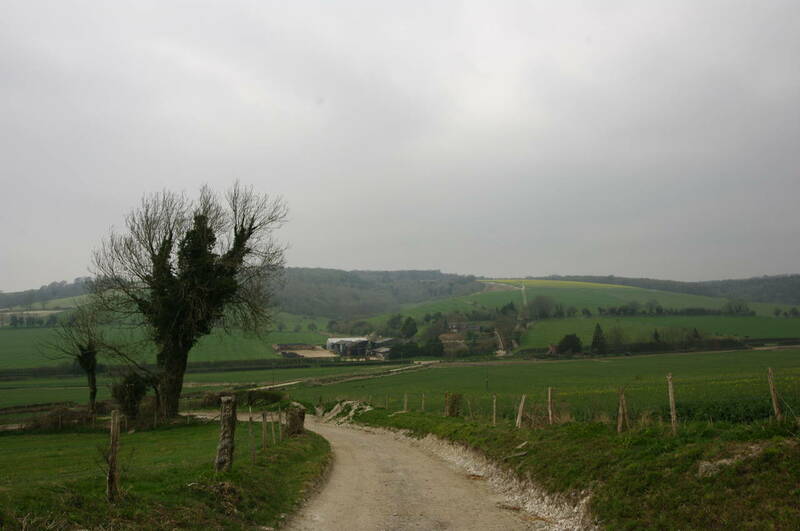 After around a kilometre, the track begins to descend from the downs with views opening up across the valley ahead (picture 21). The path eventually reaches a junction of tracks at Manor Farm (picture 22), a few hundred metres uphill from the busy A286 road. 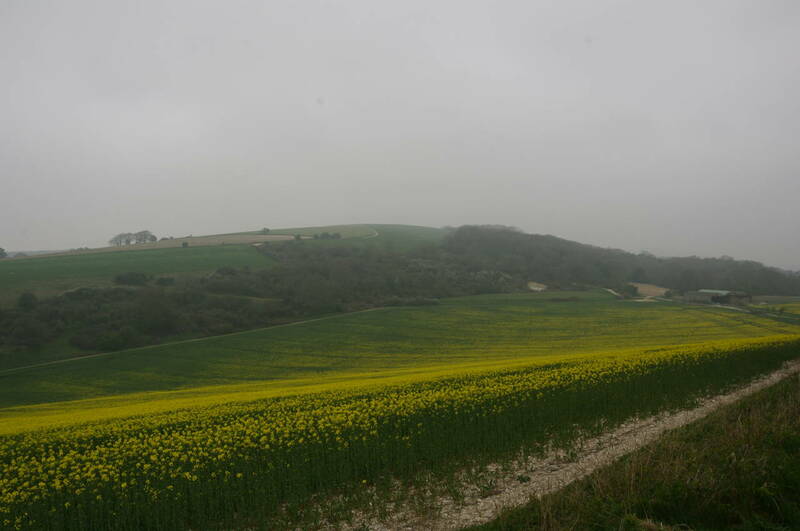 Here I left the South Downs Way for the day, following a track north for about 1200 metres to the village of Cocking. 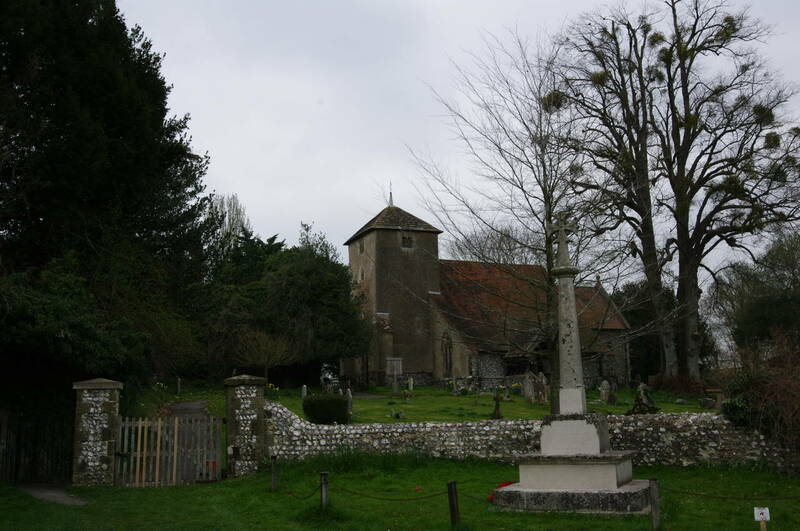 Reaching the edge of the village, the track becomes a lane which leads past the parish church (picture 23), and up to the A286 which cuts the village in two. My GPS showed that I had walked 20.2km for the day, with 19km of that being on the official route of the South Downs Way. 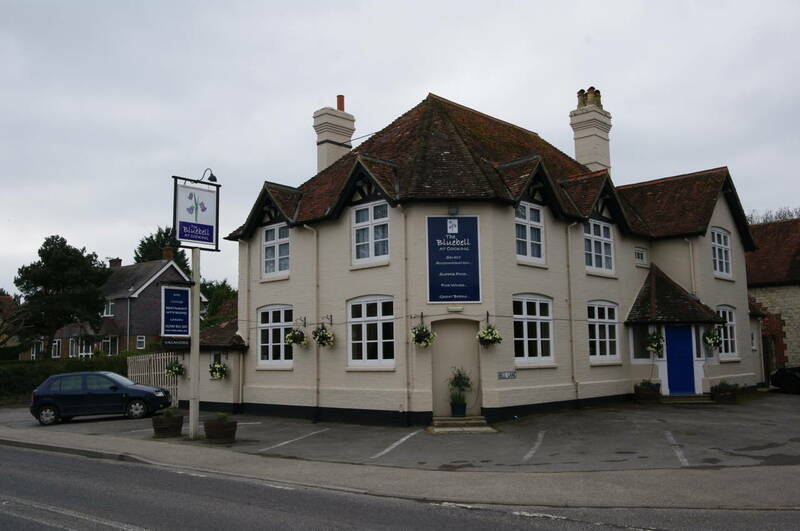 Standing on the opposite side of the main road is The Blue Bell (picture 24), marked on my map as a pub, but now evidently rebranded as a "restaurant with rooms". Unable to end my walk in a village pub as I had planned to do, I instead bought some sandwiches from the small village store opposite the former pub and had a late lunch in the park just down the road while I waited for the next bus to Chichester. 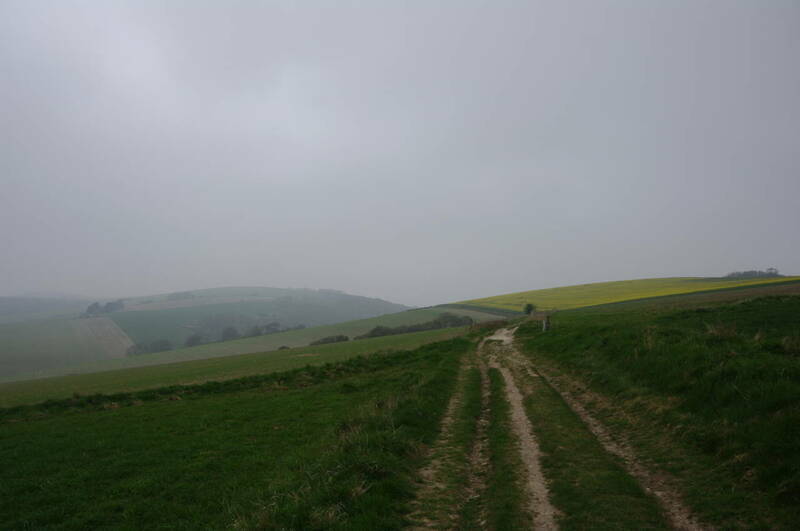 Ironically, the weather in Chichester was clear and sunny -- very different to the cloudy and misty conditions on the downs despite being no more than fifteen kilometres apart.